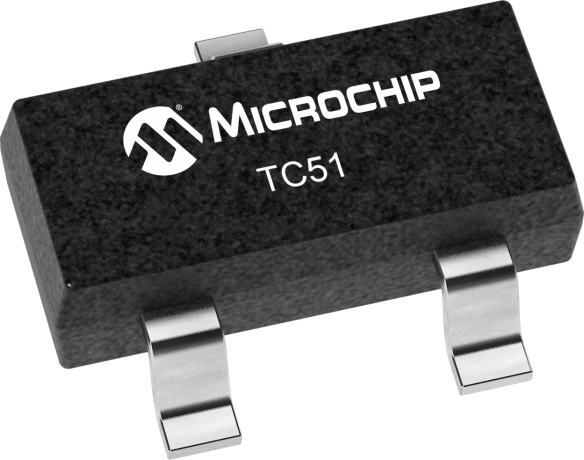 The TC51 is a very low power, open drain output, CMOS voltage detector with built-in delay. It is particularly well-suited for battery powered applications because of its extremely low 1µA operating current and small surface-mount packaging. Each part is laser-trimmed to the desired threshold voltage, which can be specified from 1.6V to 6.0V. The standard built-in output delay is 50msec-200msec. The device includes a comparator, low-current highprecision reference, laser-programmed voltage divider, hysteresis circuit and output driver with digital delay timer. In operation, the TC51’s output (VOUT) remains in the logic HIGH state as long as VIN is greater than the specified threshold voltage (VDET -). When VIN falls below VDET -, the output is immediately driven to a logic LOW. VOUT remains LOW until VIN rises above VDET - by an amount VHYST, whereupon it returns to a logic HIGH after expiration of the built-in delay time.